This Barney special is a delightful holiday movie for young children, celebrating the holiday season with the big, purple dinosaur, Barney! 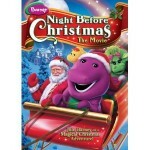 Barney and the kids take a fun and musical adventure to the North Pole to be special guests of Santa Claus! What more fun could you possibly have as a purple dinosaur for Christmas? Ms. Claus takes all the kids on a fun train ride through the toy factory, and they are all awarded with secret toys just for them! It’s funny, heart-warming, and a great video for a younger audience!